GENEVA, Switzerland, October 8, 2015 (ENS) – “Climate change is the greatest threat to global health in the 21st century,” warned Dr. Margaret Chan, director-general of the World Health Organization today. “The evidence is overwhelming: climate change endangers human health,” Dr. Chan declared, citing the effects of extreme weather events, infectious diseases, diminishing water supplies, and food insecurity. “Solutions exist and we need to act decisively to change this trajectory,” she stressed. The usually calm-tempered doctor took on a tone of urgency as she considered the possible outcome of the United Nations climate conference this December in Paris. There, world leaders are expected to sign a universal, legally-binding agreement to limit their greenhouse gas emissions enough to keep the global temperature rise at or below 2 degrees Celsius compared to pre-industrial levels. “WHO calls on the global health community to add its voice to the call for a strong and effective climate agreement, that will save lives, both now and in the future,” she said. Chan’s message is directed towards the world’s entire health care community. “Health professionals have a duty of care to current and future generations,” she said. She pointed out that 2015 is already the hottest year on record. The World Meteorological Organization said late last month that global mean temperatures near the Earth’s surface continued to set new records between 2011 and 2015, consistent with rising levels of greenhouse gases in the atmosphere, according to preliminary findings of the assessment of the state of the climate in the current five years period. Chan is urging nations to scale up financing for adaptation to climate change, including public health measures. 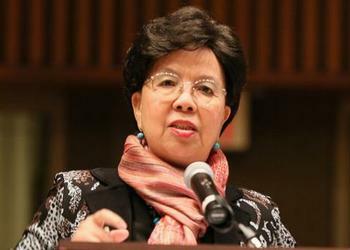 She said the World Health Organization is committed to leading by example, by raising awareness of the health effects of climate change and the potential health co-benefits of low carbon pathways, among health professionals and the general public. Under her leadership, Chan said, WHO will contribute to the development and implementation of measures to limit climate change and protect countries, workplaces, and communities.